Ride out to the beautiful blue waters of the Bahamas on our 72-foot double decker catamaran vessel to experience the one and only Paradise Snorkel and Parasailing Combo package! This tour takes Bahamas watersports to the next level. With an unforgettable snorkeling journey on the vibrant coral reef gardens to flying some 600 feet up in the air, this tour is for the bold and the adventurous and anyone who wants to make sure their visit to Nassau, Bahamas is a truly memorable vacation! 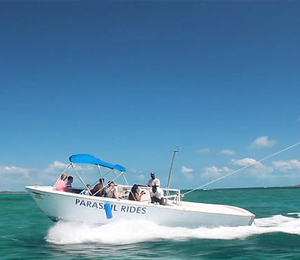 With the four-hour Paradise Snorkel and Parasailing Combo tour in Nassau, you and your group can experience a pretty comprehensive Bahamas watersports package. This tour starts off with a historic and picture-perfect sightseeing boat tour past Nassau harbor. It then heads out to the thriving coral reef gardens of the Bahamas, where guests will be able to take a first-hand look at a world unlike any other. After snorkeling, it is time for beach and even more fun in the sun! From the beach, guests will climb on board our smaller parasailing vessels and float some 600 feet in the air for about ten minutes. From this bird’s-eye vantage point, guests will get to see the Bahamas like never before! Parasailing is completely safe and completely fun! Guests of all ages will enjoy the thrill of flying this high! But there is still more! This tour also includes a full barbecue lunch, Bahamian style featuring barbecue chicken and peas and rice! This tour runs parallel with some of our other tour packages including the Paradise Ocean Snorkel, the Paradise Snorkel & Jet Ski Combo, and the Nassau Do It All package! That means that people in your party can do these different Nassau tour packages and still be on the same tour! I have been to the Bahamas many times, but Nassau Ocean Snorkel and Parasailing Combo is one of my favorite trips! It includes everything that everyone should do here. As a Bahamas veteran, I can say only the best about this experience!